Note that the following covers the DS211+ device, which is characterized by being based on the Marvell Kirkwood mv6282 ARM core (1.6Ghz version of 1.2Ghz mv6281). AFAIK the content of this blog entry should be equally applicable to all DS211 variations, but you should consult the Synology wiki for your device to be certain. While quite feature rich out-of-the-box, developer types will likely want to make their NAS do even more, either out of a real need or just to tinker. For instance, I eventually plan to connect my USB weather station and generate live charts. Because of the modding desire, Synology has a faily comprehensive wiki about the subject. To make a long story short, ease of modding is greatly assisted by the possibility of installing Optware package manager. Optware (ipkg) is an online package system a la what you may know from Debian/Ubuntu. This makes it easy to locate, install and uninstall compiled binaries (*.ipk) through the command-line. Bootstrapper and Optware packages are maintained by the NSLU2-Linux community for use with various modifiable hardware devices incl. 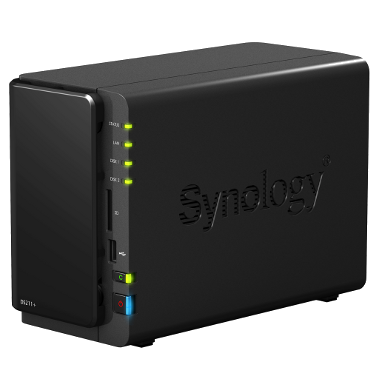 many Synology products. The installation procedure simply involves you downloading and installing the Optware-bootstrapper for your NAS. Here's what I wrote while logged in as root via SSH/telnet, to get it working. Note, if you get the message "Error: CPU not Marvell Kirkwood, probably wrong bootstrap.xsh", this is likely due to a too agressive sanity check (mv6281 but not mv6282) in the install script. If the output of the command "cat /proc/cpuinfo" mentions a "Feroceon" CPU, then you may safely open up the file "/volume1/bootstrap/bootstrap.sh" and edit line 21, changing "Feroceon-KW" to just "Feroceon", and run the script manually with "sh /volume1/bootstrap/bootstrap.sh". You can list all packages with "ipkg list" or search specific packages with "ipkg list [wildcard]". To install a package, simply type "ipkg install [name]". You may also browse the available packages by accessing the repository directly from within a browser. Note that the above wipes the rc.local script. If you have added custom stuff beyond just Optware, you should edit out the Optware stuff manually! Of course, there aren't as many packages available as one would like, but it's still impressive that you can install Mono, Java, Python, Perl, Lua etc. on a small NAS device just with a single command. Hope this entry helps others get to hacking on their Synology device. Nice! I'm waiting on my new DS211+ to be delivered and I found your article. Thanx! Very nice article. Much appreciated! Try installing with "ipkg install mono_2.4-1_arm"
I can't get this working after updateing to DSM4... I hope there is a solution to this. I have not tried it on DSM4, but will look into it soon. You have to redo the symbolic link for the opt directory, and reboot. The link gets broken with the update. mono is not in the ipkg repository anymore. Any hints on creating the package manually? Bummer, I've come to rely on C# for much of my open source hobby stuff. We should try to contact the ipkg maintainers. Thanks, I had a problem that Optware prevented expansion of my volume after upgrading from 1TB to 3TB drives in a 207+ with RAID1. Then going into the Storage Manager in DMS the button for handling the volume was no longer grayed out. Pressing it unveiled options to expanding the volume. or long press on the front panel power button. and it will soon be back online with both Optware and the expanded drives.